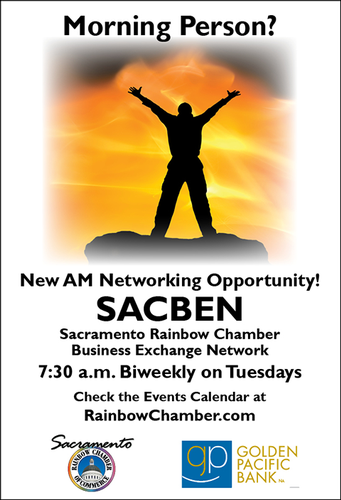 What I do: I am an outspoken ally and friend to Sacramento’s LQBTQ Community. I have been the Communications Liaison for River Bend Medical Associates since 2015 but began working for the practice ten years ago. River Bend Medical Associate's mission has encouraged my active participation in the Rainbow Chamber as an Ambassador and SACBEN Member. River Bend Medical Associates is a culturally diverse team that values honesty, integrity, and loyalty in our delivery of compassionate family health care. We are committed to promote and inspire the growth and well-being of our employees and the communities we serve. River Bend is Listed as an LQBTQ friendly family practice, and we hope to set an example of explicit, rather than implied support. How I do it: I am proud to represent the Family Practice that my father helped found in 1992. You can find me networking, volunteering and generally out in our communities educating and informing patients and neighbors alike of all the resources around them. In our offices in West Sacramento and South Land Park, I spend my time managing our patient portal messages, and providing each of our patients with a specialized human experience to managing their healthcare. I treat our patients like they are friends and family simply because they are! Why I do it: I do what I do because I have always been taught to do what you can for others with what you have. I love my job and feel very privileged to have earned the confidence and trust. My goal is to extend the service capabilities of our caring and talented Physicians and Clinicians so that my neighbors have access to quality medical care with an emphasis on the care of the whole person.